For authentic Indian spices, look no further than this set of three authentic blends. The hunt for the fresh, authentic spices that make Indian cuisine so compellingly complex can be an equally complex errand, but this set of spice mixes means you only have to reach into your spice cupboard. Grown and hand-harvested in small batches in Wayanad, India, the savory array of ingredients that make up these three masalas includes cumin, cinnamon, coriander, black cardamom, clove, nutmeg, turmeric, and fenugreek. 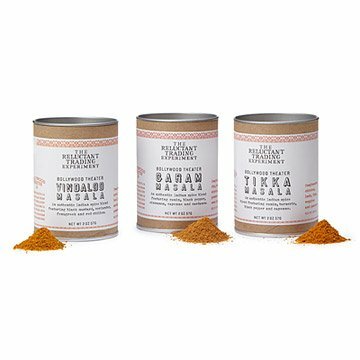 These and many more spice notes are custom-blended in three kaleidoscopes of flavor used for different varieties of Indian dishes-multifaceted Garam Masala, exhilarating Tikka Masala, and fiery Vindaloo. The set's attractive packaging includes a recipe to start your spice adventures. Spices produced in India; blends handmade by Scott Eirinberg and Chef Troy MacLarty in Highland Park, Illinois. It could have been fate that brought Scott Eirinberg and Chef Troy MacLarty together. Scott stumbled on Troy MacLarty’s restaurant in Portland, Oregon, which was decorated from floor to ceiling with memorabilia and trinkets from India. Black and white family photos, religious statues and funky chandeliers were everywhere. Even the food was served on traditional steel plates. Chef MacLarty was serving beautifully prepared Indian street food. Scott had dahi papri chaat, a kind of Indian nachos, and kati rolls, something like an Indian burrito. The food was so extraordinary that he went back the next day for more. It wasn’t long before the two started brainstorming about creating a home version of his Indian masala mixes using fresh spices from India. Scott still wonders: was it fate that brought the pair together, or the kati rolls? Keep spice tins closed to maintain freshness. Exotic, hands-on cooking party-w/ all the myriad spices required for a tasty outcome, these spices provided the perfect mix! More time could be spent socializing. Gave this to a friend for Christmas; she loved it and uses it at least once a week! Wow! These masalas are incredible! As soon as I opened the bag, I knew these were special. They are incredibly fresh and smell incredible. They even come with a different recipe in each one. Beautiful packaging. Going to get some to give as gifts for the holidays too.